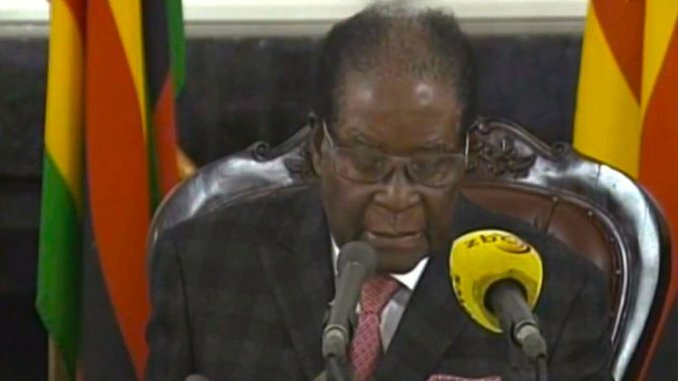 Zimbabwe President Robert Mugabe addressed the nation on Sunday, but did not formally announce his resignation hours after the ruling party fired him and threatened to impeach him. The ZANU-PF party threatened to impeach Mugabe if he didn’t resign by noon Monday. Recently fired Vice President Emmerson Mnangagwa was appointed as the new leader of the party and is expected to lead a new government. Mugabe is expected to address the nation on Sunday. Meeting chair Obert Mpofu called Mugabe the “outgoing president” and said Sunday was a “sad day” after 37 years of ruling Zimbabwe. “He has been our leader for a long time and we have all learned a great deal from him,” Mpofu said. But Mugabe “surrounded himself with a wicked cabal” that brought him down, Mpofu added, saying that the leader’s wife “and close associates have taken advantage of his frail condition” to loot national resources. Senior figures of the party gathered early Sunday for an emergency meeting of the party’s Central Committee to discuss calls to expel the 93-year-old leader. First lady Grace Mugabe was also recalled as head of the women’s league. As he and his wife remains in their lavish mansion, Mugabe’s allies left or were arrested. Vast throngs of demonstrators turned Zimbabwe’s capital into a carnival ground on Saturday in a peaceful outpouring of disdain for their longtime leader and calls for him to quit immediately. People in Harare clambered onto tanks and other military vehicles moving slowly through the crowds, danced around soldiers walking in city streets and surged in the thousands toward the building where Mugabe held official functions. “The old man should be allowed to rest,” former Zimbabwe finance minister and activist Tendai Biti told South African broadcaster eNCA. On Friday, all 10 of the provincial branches of the Zanu-PF party demanded Mugabe’s resignation. The military intervened when Mugabe decided to fire his deputy, setting in motion his abrupt fall from power. Without the military’s intervention, first lady Grace Mugabe likely would have replaced him as vice president and been in a position to succeed her husband. But the 52-year-old first lady is unpopular among many Zimbabweans for her lavish spending on mansions, cars and jewels. Last month she went to court to sue a diamond dealer for not supplying her with a 100-carat diamond that she said she had paid for.